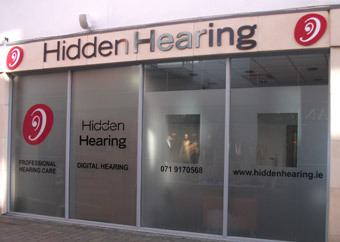 Hidden Hearing, Ireland’s premier hearing healthcare provider, is located at Unit 12 Quayside Shopping Centre, Wine Street, Sligo. The state-of-the-art hearing centre offers the best professional hearing care, help and advice in a supportive environment along with the latest digital technology to diagnose and treat hearing problems. Hidden Hearing offers free one-to-one hearing consultations and free earwax removal – call 071 917 0568 to book now. Over the past 30 years, Hidden Hearing has evolved to become Ireland’s premier provider of hearing healthcare in the private sector with a national network of 65 branches and clinics. Hidden Hearing conducts over 30,000 free hearing screenings every year and is the only hearing healthcare provider in Ireland to offer free, no obligation hearing screenings, free earwax removal, a 90 day money back guarantee, 0% finance, a 4 year warranty and free batteries and service for life.